Midwest Landscaping is a design/build, sustainable landscape construction and horticultural consultation company based in Long Beach, California. The company was established in 1989 by Edward & Jaie Wallace as a landscape maintenance company and has become an award winning California state contractor licensed landscape design/build company. Whether it's a simple patio area where you can relax and unwind or a unique gathering place for family and friends, we can help you turn your dreams into reality. 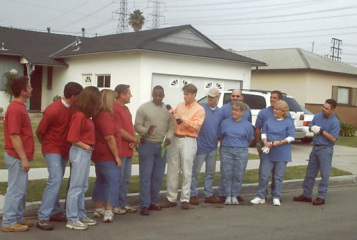 HGTV 'Ground Rules' Taping In Torrance, Calif. Contractor Edward L. Wallace & Landscape Designer Rama Nayeri At Award Winning Project In Garden Grove, Calif.
Hardscape And Softscape Project In Tarzana, Calif. Selecting trees in Redondo Beach, Calif.